How CMS, ONC, and HHS can encourage interoperability and accelerate its timeframe. The methods of authentication that could be used and how can the industry can be aligned to support them. How patients and physicians can be engaged in interoperability and how and any HIPAA issues can be addressed. How can the private sector can become engaged and their participation jump-started by the government’s release of claims or other data. Fairly few male readers are worried that incidents in their past could result in new claims of sexual harassment. HarassedMan was pursued by a male superior and urges employers to provide clear training, policies, and enforcement procedures. HISJunkie wonders whatever happened to innocent until proven guilty and also suggests that a man who is terminating a female employee for cause think carefully about the situation. Did you rebuff the advances, and if so, did it hurt your career? Did you report it to HR, and if so, was the issue resolved to your satisfaction? If you didn’t rebuff or report, why not? Have you ever provided sexual favors or accepted sexual situations — or worked with someone who did — to get hired or to improve job prospects? This is hard to ask, but it happens and encourages bad situations for others. I feel sorry for a man or woman who successfully stops an uncomfortable situation but sees their job suffer because co-workers accept it as quid pro quo. Are you considering taking any legal action or going public with incidents from your past? Three dozen clinician respondents are mixed on whether hospital VIP patients have better clinical outcomes. 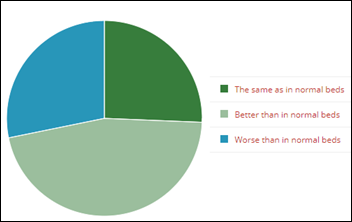 Nearly half say yes, while around one-fourth each say the outcomes are the same or worse as in the cheap seats. I was appalled at my first hospital job in learning that my for-profit employer – whose outcomes were universally terrible, as you would expect when bean counters oversee all the clinical decisions of a badly educated medical staff recruited for obedience and volume rather than quality –cleared an entire hallway to house the hypochondriac mother of our very profitable eye surgeon. Our profit-obsessed executives convened emergency department head meetings to make sure everybody figuratively genuflected to meet her every need (I got stuck running out to get the kind of wine she preferred since our nutritional services people could barely open cans and heat up food service frozen entrees) and made rare appearances in patient care areas only because she was propped up back there like a queen. At least working for a for-profit hospital shortened the path to my disillusionment with hospitals and maybe humanity in general. Lab coats, goggles, science journals, and activity kits for Ms. G’s fourth-grade class in Los Angeles, CA. An IPad for running programmable robot kits for Ms. S’s elementary school technology club in Los Angeles, CA. Three video cameras for home science experiments for Mrs. S’s third-grade class in Philadelphia, PA. STEAM activity kits for the after-school elementary school program of Mrs. M in Springdale, AR. Math activity kits and games for Mrs. H’s elementary school class for the deaf and blind in Mobile, AL. Programmable robots for Mrs. W’s elementary school class in Cartersville, GA. Programmable robots for Mrs. O’s elementary school class in Garland, TX. STEM kits and experiment books for Mrs. A’s elementary school class in Detroit, MI. Six electronic note pads for Mrs. N’s elementary school class in Farmville, MI. Take-home math and STEM games for Mrs. F’s elementary school class in Mescalero, NM. A STEM bundle for Mrs. T’s kindergarten class in Dallas, TX. Take-home math game bags for Ms. M’s elementary school class in Bronx, NY. 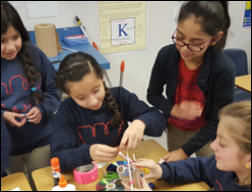 STEM games for Mr. M’s elementary school class in Milwaukee, WI. Weekly take-home science projects for Ms. I’s elementary school class in Oxnard, CA. President Obama signs the 21st Century Cures Act into law. The Wireless-Life Sciences Alliance trade group and the HIMSS-owned Personal Connected Health Alliance merge. CommonWell Health Alliance and Sequoia Project’s Carequality announce plans to connect their respective systems. The American Heart Association, AMA, DHX Group, and HIMSS launch the non-profit Xcertia to establish best practices for mobile health apps. SocialWellth brings back the Happtique app certification program. MD Anderson considers layoffs and research cutbacks after losing $102 million in the first two months of its fiscal year, with the cost of its Epic implementation being one of four factors hurting its bottom line. Mediware acquires inpatient rehabilitation and respiratory services documentation systems vendor MediServe. Allscripts sues NYC Health + Hospitals for choosing Epic at what the company says is a $535 million premium to its own bid, to which the health system responds that Allscripts lacks an integrated EHR and that the company is suing to try to prop up its sagging share price. McKesson Paragon beats out Cerner as the #2 product suite behind Epic in Best in KLAS, while Agfa, McKesson, and Allscripts were ranked as the worst vendors overall. Dairyland Healthcare brings in a new executive team following its acquisition by Francisco Partners. NextGen creates a revenue cycle management division for physician practices. Philips acquires ICU monitoring technology vendor Visicu for $430 million, paying 12 times Visicu’s annual revenue. Dignity Health and Catholic Health Initiatives announce plans to merge in creating the country’s largest health system in terms of revenue. Advocate Health Care announces plans to merge with Aurora Health Care. CVS announces an agreement to buy Aetna for $69 billion. Former GE CEO Jeff Immelt says the company tried to buy Epic but was immediately rebuffed and also considered acquiring Cerner but thought the $2 billion price was too high. Philips acquires Netherlands-based, 200-employee population health management software vendor VitalHealth Software, co-founded by Mayo Clinic and Noaber Foundation in 2006. The company expands the informatics work Philips started with its acquisition of Wellcentive in 2016. Philips acquired Netherlands-based interoperability software vendor Forcare last week. Patient payments technology vendor Cedar raises $13 million in a Series A funding round. Co-founder Florian Otto, DDS, MD, PhD was sales VP for ZocDoc before starting Cedar in April 2016. The urge to merge reaches manic levels as Ascension and Providence St. Joseph Health are reportedly talking about combining to create a 191-hospital system with $45 billion in annual revenue, eclipsing last week’s signed agreement between Dignity Health and Catholic Health Initiatives that set the short-lived annual revenue record of $28 billion. Ascension is a Cerner shop, while Providence St. Joseph Health – formed in a July 2016 merger — uses Epic, Meditech, and Allscripts. Albion Family Practice (PA) will switch from Allscripts to Epic ambulatory EHR in 2018. 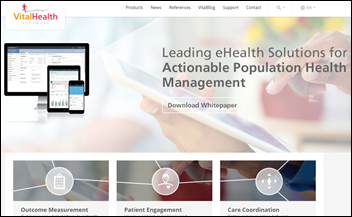 Saratoga Hospital Medical Group (NY) went live with Athenahealth ambulatory EHR in Q4 of 2017. Munroe Regional Medical Center (FL) switched from Medhost to Cerner in 2017. Atlantic Health System promotes Ben Bordonaro to chief administrative information officer. A GAO report finds that the VA spent $1.1 billion on four failed efforts to modernize VistA – HealtheVet, iEHR, VistA Evolution, and EHRM. GAO also notes that the VA has requested $4.1 billion for IT in 2018. 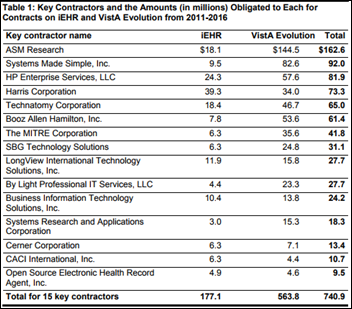 Among the 15 key VA contractors on the failed projects was Cerner, who will sell the VA its VistA replacement system. An interesting tidbit from the report is that two of the VA’s systems are over 50 years old, both of them COBOL-based mainframe systems. UNC Health Care (NC) notifies 24,000 patients that their PHI was contained on an unencrypted laptop stolen from a dermatology practice it had acquired in 2015. The health system pledges in the announcement to do a better job of reviewing the security of practices it acquires. 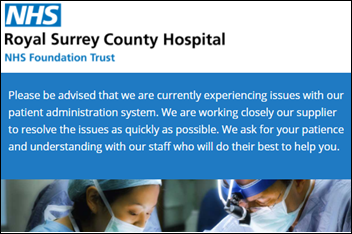 In England, Royal Surrey County Hospital goes back to paper scheduling after an upgrade to its Allscripts system fails. I think they are using the Oasis Medical Solutions PAS, acquired by Allscripts in mid-2014. 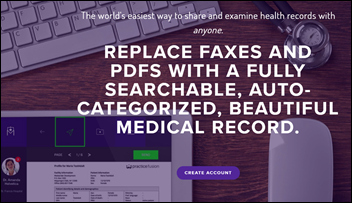 I ran across Medsender, a company I hadn’t heard of that promises to end 100 percent of medical record faxing or else there’s no cost to the customer. The company claims the product can be installed in 60 seconds and works with any EHR. Founder/CEO Zain Qayyum developed the product in 2014 while attending Marist College full time. 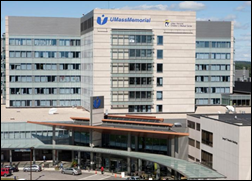 The operating income of UMass Memorial Health Care (MA) declined 74 percent in the fiscal year that ended September 30, with executives noting a modest increase in insurer payments, its $200 million in capital projects, and a $700 million Epic implementation that has taken doctors away from their revenue-generating clinic work as they build the system. Sunquest Information Systems hosts its 19th annual holiday toy drive for Aviva Children’s Services. Surescripts will exhibit at the Health Care Law Institute 2017 December 14 in New York City. A national IDN upgrades to ZeOmega’s Jiva 6.1 population health management platform. LogicStream Health will exhibit at the IHI National Forum December 10-13 in Orlando, and will host a poolside party December 11 from 6:30-8:30pm ET. 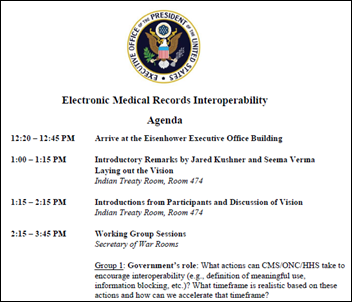 Re: The White House’s Office of American Innovation will host a half-day meeting Tuesday on EHR interoperability, led by Jared Kushner and CMS Administrator Seema Verma. Huh? Is this the same Jared Kushner who is brokering a peace treaty in the mid-east? Who knew a real estate background could be so valuable?!!? Also of note that ONC & Dr Rucker are NOT co-hosting the event. Hope he’s invited. And were those bullet points written by Jared and Seema or was Mr. HIStalk uncharacteristically lax in checking his work? I so want it to be the former for a variety of reasons. Not sure why the Cerner bashing re the VA when most of the contractors/consultants on those failed projects, who took home orders of magnitude more $$$, are still happily drinking from the federal trough. Cerner is notorious for “nickel & diming” even in the private sector where accountability is high. Combine them with the VA, which is notoriously unaccountable – among the most sought-after troughs for trough feeders – and you have the world’s simplest 1+1 formula for disaster. We all are literally watching them dig the trenches and connect the plumbing for an inescapable future pipeline of captive add-on selling. Just because Cerner is a newcomer to the government trough, doesn’t mean they’re going to change behavior once they start guzzling from it. First: “innocent until proven guilty” is shorthand for how our legal system works. It does not apply — or at least does not need to apply — to personal or working relationships. I don’t need to wait until I get some legal threshold of proof of guilt when five women tell me that Person A is a serial groper. I’m going to stay out of arms’ reach. Second: what proof would he like? Most sexual misconduct doesn’t happen in front of an audience, and even when it *does* the witnesses simply will not say what they saw or heard (and I could go on for a long time about why that is). How exactly would he like me to prove that my boss spent an entire meeting rubbing his leg against me under the table? What proof should I produce of another boss asking me to have an affair with him? How about the colleague — who later *became* my boss! — who groped me at a company function? Third: I’ll speak in broad terms here, but women do not have any faith that whatever “process” is established will actually work. We’ve seen and experienced over and over again that abusers will get away with it clean, or with a slap on the wrist at worst, while the abused will be punished by ostracism, being moved to another part of the company (i.e. having all their work taken away from them), or outright fired (don’t tell me “there are laws against retaliation”. There are also laws against sexual harassment, and yet here we are.) How many times do you expect us to believe that *this time* Lucy won’t pull the football away? Epic is not an acronym, Associate CIO. Interesting perspective on industry consolidation equaling EHR consolidation. In healthcare and the wider horizon of business in general, acquisition and consolidation are not always equated. Often the low hanging fruit of supply chain, CRM and ERP consolidation drive far more opportunity to reduce duplicative overhead. EHR consolidation is far more difficult when those back-end integrations are left un-done. It does pay to consolidate when there is a top-down appetite and support to simplify and manage EHR configuration organization-wide. Would be great to know who’s at the EHR table along w/ kushner and verma. Cerner, epic, allscripts peeps? + HIMSS ? + ONC ? + who ? Guess real estate and foreign relations are all good options for alt. career once these giants all self-distruct and die and slow death taking us all down with the crappy software! Given the clean up at State dept. perhaps there will be openings! Just a thought for your poll this week. I think one of the options should be “None”. The way the poll is set up assumes every woman has experienced sexual harassment in the work place. I may be in the minority, but I have been in corporate America for 20 years now (I am at the vice president level of a fortune 200) and have fortunately never experienced sexual harassment. Hopefully there are others out there who have had the same positive experience. Agreed. Providing a “none of these” option for a multi-option poll doesn’t work, though, and the space allowed for the description wouldn’t allow “for those women who have been sexually harassed.” I opted for this format knowing that I wouldn’t get a denominator value given the “none” option. I was more interested in the forms of behavior experienced rather than the quantity, but if I do a survey, I will be able to expand further. It assumes that people responding to the poll are people who have experienced harassment and assault. If you haven’t, then the poll is not for you.